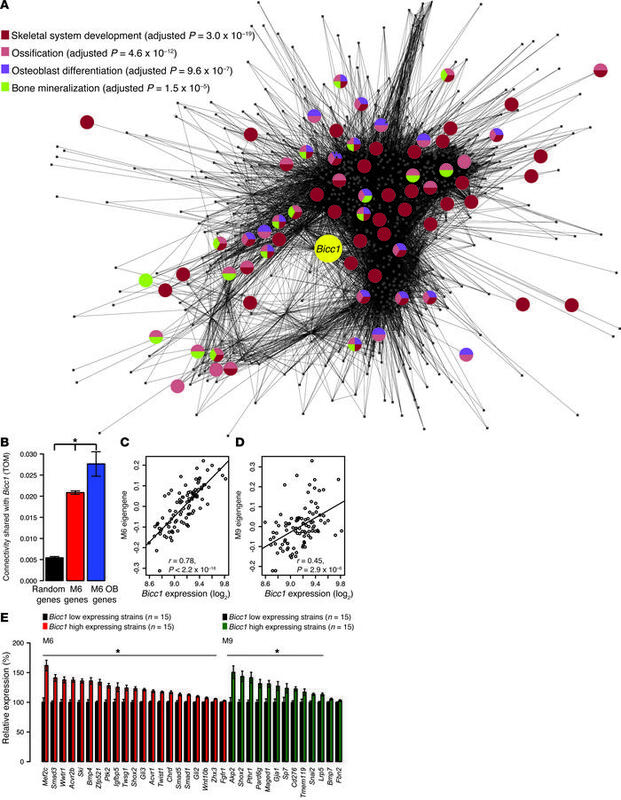 Network analysis predicts that Bicc1 plays a role in osteoblast differentiation. Bicc1 is a member of M6 (A). The strongest (TOM >0.05) connections between M6 genes (nodes connected by lines) are displayed in A. The location of Bicc1 is highlighted and each node is colored based on the gene ontology annotations listed in the top left corner of A. Connections between Bicc1 and M6 genes involved in osteoblast differentiation (M6 osteoblast [OB] genes) were stronger than all other M6 genes and stronger than a random set of genes equivalent to the number of genes in the M6 (B). Bicc1 expression was highly correlated with the M6 (C) and M9 (D) module eigengenes. The expression levels of M6 and M9 osteoblast differentiation genes were higher in HMDP strains with high Bicc1 expression (red and green bars) (E). Data presented in B and E are the means ± SEM. *P < 0.05.